San Francisco did it once again. Stood up for what is the truth and denounced the evil and dubious ways of those chosen few who hood winked the United States and got in the White House through that door in Florida. We have not found the Weapons of Mass Destruction. We did not state we were going to occupy Iraq. And most surely as I can remember no one ever said that so many of our beloved service women and men would die. Our soldiers are trained to defend this country and fight a war. They are not generally trained to police another country and be taken pot shots at. Over 50,000 people from all walks of life marched and gathered in front of San Francisco's City Hall. The nice summer day worked well and the unanimous chant "get rid of Bush once and for all". The Iraqi war has devastated our economic and billions of dollars have been spent unwisely mostly pandering to the crooks imbedded in Iraq with connections to the White House. Bechtel and Halliburton have and continue to make millions. They keep employing people from 3rd world countries and paying them the lowest wages to get work done. The Iraqis will not stand for injustice and today in some parts of Iraq the people are worse off then when Sadam Hussein was in power. Here in San Francisco we have had the opportunity to meet many that have visited Iraq after the war and the picture they paint is not nice. Children and others are still dying. Bombs go off at all times of the day and night. Gunfire is something most everyone takes for granted. The power plants and the water treatment plants are taking forever to come on line. In the summer people are suffering from the heat and hospitals do have medicines but lack the other necessities which makes it difficult for the doctors, nurses, and patients to heal and recover. Gas is imported from Kuwait and sold to the Iraqis at 5 cent per gallon. Iraqi oil pipes are damaged and some that are in place are being repaired. Many oil wells are back on track but the distribution system is constantly under attack by those who do not want the outsiders ruling their country. The Kurds are gaining power. The Shiites who are in the majority are watching the play and are not too happy. Caught in between the Sunnis, the other tribal leaders, the Christians, Jews, and a host of minorities from all over the world. Mercenaries from South Africa, France, Belgium, and other countries get paid well to guard certain areas and some oil pipe lines. People from the 3rd world countries work long hours with little pay to cook and do other menial jobs. The prime contractors are making the money and all of them have ties to the White House and the Republican Party. It is a shame that the lying Bushes have destroyed this country. It is only fair that Bush and his family be put on trial. The sooner the better Ashcroft has not been feeling well - karma has caught up with him. It is just a matter of time before the others fall prey to the large amount of harm they have done by their actions in Iraq. San Francisco is the conscience of the Nation and we always stand for what is right. Today, over 50,000 plus marched and they all marched peacefully. 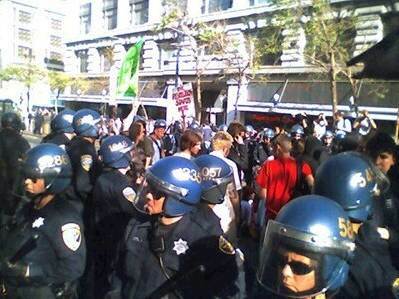 They were a few who wanted to confront the San Francisco Police and they were arrested peacefully. The lesson is clear to one and all - bring back our troops each and every one of them. The sooner the better. We also have to vote Bush out of the White House. This man has caused the Nation enough damage and we cannot afford another term. San Francisco, you have done us all proud.